Channel Islands National Park may be one of the least-talked-about places in California, but it shouldn't be. Here's why: The five islands off the coast near Ventura are the closest thing in California to the Galapagos. These islands were never part of the California mainland. Each of them is distinctly different in appearance, with plants and animals living there that exist nowhere else. Most visitors go to the islands using a boat or air service who are concessionaires for the National Park Service. Others arrive by private boat. More intrepid visitors can bring along camping gear and food and stay in one of the primitive campgrounds. The trip by boat can be as exciting as the islands themselves, especially when you see dolphins or whales along the way. These are the islands that make up the park, in order from the mainland going west. The park headquarters is near Ventura Harbor, where there is a visitor center. 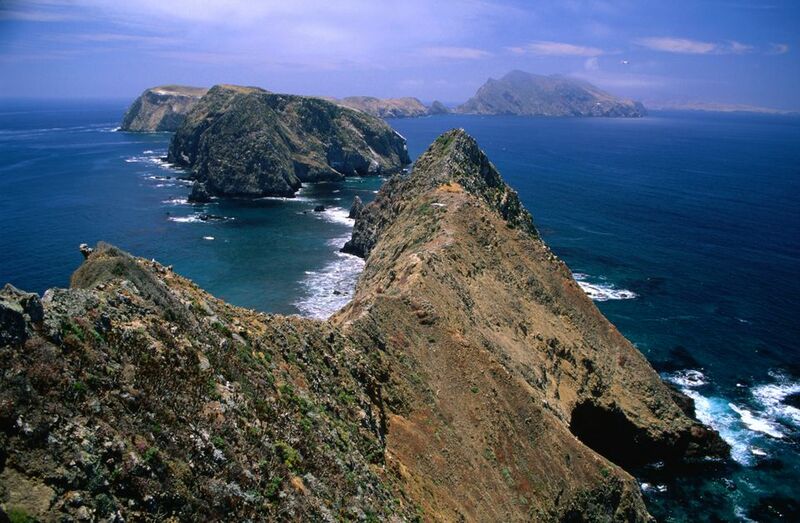 Anacapa Island is a narrow, windswept rock with annual rainfall less than 10 inches and no trees. Among the wildlife on Anacapa are the world's largest breeding colony of western gulls and the largest breeding site for endangered California brown pelicans. Other unique wildlife includes the rare Anacapa deer mouse and eight species of songbirds. Because of its steep cliffs, there's no boat dock on Anacapa. Visitors have to climb a metal ladder up the cliffside from their boat. But don't worry about that too much. The crews are expert at getting nervous visitors on and off their boats. Once ashore, you can view exhibits and take an easy hike around the island. Santa Cruz Island is the largest Channel Island. Human habitation and ranching have changed it from its natural state, but efforts are underway to restore that. A large portion of this island is owned by the Nature Conservancy. The National Park Service owns the rest, which is open to the public. Nine of the Channel Islands' 85 native plant species live only on Santa Cruz. You can take a boat trip to Santa Cruz, but to disembark, you have to climb a steel-rung ladder to a pier. When the piers are closed, small boats carry visitors to the beach. Santa Rosa Island is home to more than 195 species of birds and the endemic spotted skunk. It's open to the public year-round, but the boat service only goes there during months when weather allows boat travel. On Santa Rosa, you can hike and explore. You'll find two mountains — Black Mountain, 1298 ft (396 m); and Soledad Peak 1574 ft (480 m) — but most of the island is covered by rolling hills. You'll also find some beautiful, white sand beaches. San Miguel Island is the westernmost and flattest island, with a ghostly caliche forest (standing sand casts of long-gone plant roots and trunks). In winter, it's home to an estimated 50,000 elephant seals, who breed and pup here. You can fly with Channel Islands Aviation. If you go by boat, be prepared for an inflatable boat transfer to the beach, which may get you soaking wet. You'll need a guide to see the interior of San Miguel Island: an island ranger, Island Packer employee, or a National Park volunteer naturalist. If you travel to San Miguel with Island Packers, the National Park has staff on the island during the camping season. Make boat reservations ahead of time. Especially during the school year, many time slots fill up with students on field trips. The boat ride can be rough. If you're prone to motion sickness, be prepared. There are no food concessions once you leave the mainland. Take enough water and food to last for the trip. You can visit the Channel Islands during a trip to Ventura or Santa Barbara. Use these guides to find out how to plan a day trip (or a weekend) in Santa Barbara — and how to spend some time in Ventura. The park is open all year, but the visitor center is closed on some holidays. If you plan to camp, you'll need a permit. Skies and views are clearest in winter. Yellow-flowering giant coreopsis blankets the islands in spring, but early fall is best overall when blue and humpback whales linger and elephant seals gather at their rookeries. Autumn's smooth seas and clear waters also attract ocean kayakers and scuba divers. The Channel Islands are about 70 miles north of Los Angeles near Ventura. Allow a full day to visit one island. To get to the Channel Islands by boat, Truth Aquatics and Island Packers are the official Channel Islands National Park concessionaires, providing regular boat service, both one-day trips, and longer excursions. Santa Barbara Adventure Company offers kayak trips and Channel Islands Aviation provides air service from the Camarillo airport to Santa Rosa Island. The Channel Islands National Park Visitor Center is located at the end of Spinnaker Drive in the Ventura Harbor. Free parking is available in the beach parking lot.